We bike! 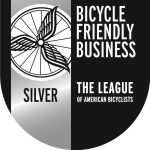 We were recently awarded a Bicycle Friendly Business award for hosting group bike rides out of our store every week and logging several thousand miles each year in employee miles. How can we help? 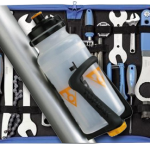 We’re always ready to offer the use of bike tools and water to cyclists. Join us! Every Thursday at 6 we join forces with Gray Goat Bicycles — our local bike store right around the corner — to host a bike ride from outside their store at 25 E Court St, Franklin, IN 46131. 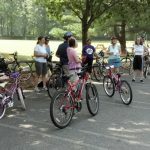 If you’re interested in other bike rides, check out the Central Indiana Bicycling Association’s webpage at www.cibaride.org to find group bike rides throughout central Indiana. Our whole family rides! Dan and Tauria have raised their kids to love riding bikes: Dan rode over 6,000 miles on his bike last year, and Tauria rode from Seattle to Vancouver in the RSVP 2016 Bike Ride last August. Second daughter Bethany teamed up with Dan to develop a juvenile arthritis awareness and fundraising campaign through an epic bike ride called Bethanywhere. To read more about her journey, check out www.bethanywhere.com. Finally, youngest daughter Zoe completed her goal of riding 1,000 miles during the year she was 9, with most of those miles ridden behind her dad on a tandem bicycle.